Join us at this fund and awareness-raising benefit for the KW Humane Society. Executive Director of the KWHS, Jack Kinch, will be speaking. Admission by donation. 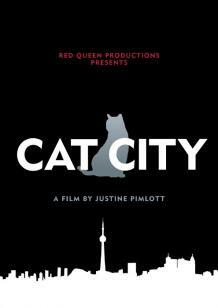 Cat City takes the viewer into the heart of the issue of cat overpopulation by going to the front-lines of the crisis in Canada, following grassroots activists, shelter workers and independent cat rescuers as they work to rescue lost and abandoned cats in and around Toronto. On any given night it is estimated that over 100,000 lost, abandoned and feral cats roam Toronto's city streets. Never spayed or neutered, these cats produce thousands of offspring adding to the ever-increasing number of homeless pets. Yet, as residents of Waterloo Region know, this problem is not exclusive to Toronto: we have our own cat crisis that needs urgent attention. The KW Humane Society estimates that 20,000 - 30,000 abandoned felines roam at large in our region. For years, euthanizing unwanted animals has been seen as a viable solution by animal control agencies to deal with cat overpopulation. Now cat rescue groups, shelter workers and humane societies alike are calling for a stop to the needless killing of healthy, adoptable animals and are demanding humane alternatives. One of the aims of this community event is to raise awareness and continue the dialogue already begun by the KW Humane Society: it's time for Waterloo Region to seriously address the problem of cat over-population. Cat City is a powerful documentary that begs the question: What does it tell us about our society when an animal becomes as disposable as a pop can? We would like to thank the generosity of the filmmakers, Justine Pimlott and Red Queen Productions for their permission to screen this film.